Backuptrans Android SMS Backup & Restore is a professional Android SMS Backup & Restore software makes it easier than ever to backup and restore Android SMS between Android phone and computer. No root required. 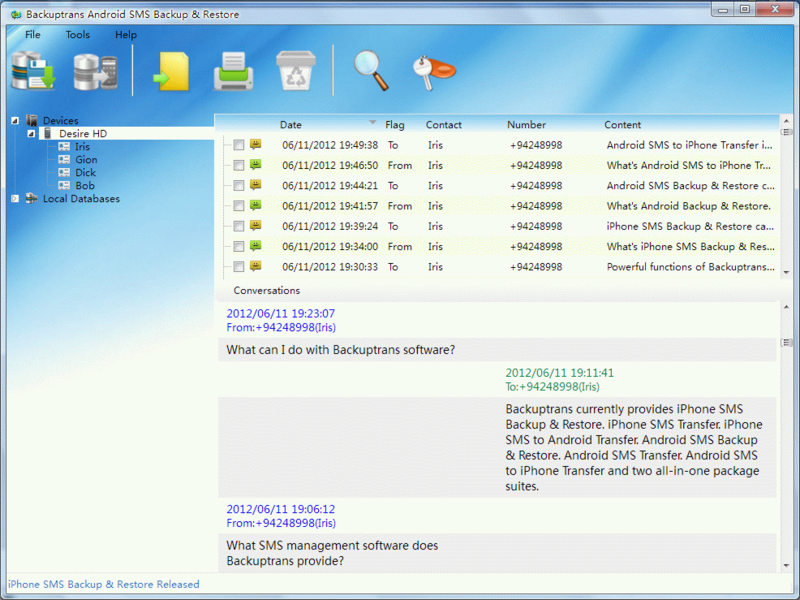 Backuptrans Android SMS Backup & Restore is a professional Android SMS Backup & Restore software used and trusted by worldwide android phone users. It makes it easier than ever to backup and restore Android SMS between Android phone and computer safely and in less time. Printing supported. Backup your important android SMS onto computer from time to time, and you won\'t worry about any unforeseen SMS loss, such as a lost phone. Meanwhile, you can also freely view, export or print out your SMS messages on your computer by the use of Backuptrans Android SMS Backup & Restore. You can backup SMS from the Android phone even with a broken phone screen. If you want to export SMS into files such as txt, csv, word or html, Android SMS Backup & Restore must be the right choice. Plus, it lets users quickly print out sms memssages in threading mode. You are flexible to decide whether to export or print all sms or only the SMS with a certain friend. What if SMS restoring? Simple enough, too. After you backup Android SMS onto your computer database, you can restore the backup file from your computer to your android phone or a new android phone whenever you need. View your old SMS on your new phone on the go. 1 Backup Android SMS onto local database on computer. 2 Restore SMS to Android from computer. 3 Export Android SMS into document files. 4 Print out Android SMS in amazing threading mode. 5 Smart Search and Filter. Manually NSF to PST Conversion is a difficult task for users so that users can use this free Instant Data Care NSF to PST Converter Software that provides easy process to convert NSF to PST File with preserve all emails data. a point-in-time copy of the data that can be restored to a server at a later time.